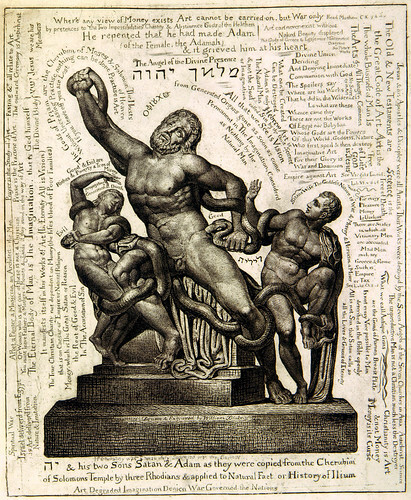 This is an engraving by William Blake called “The Laocoon as Jehovah with Satan and Adam.” It was done around 1820, but to me, it looks like it could be a graphic for yesterday’s New York Times magazine. A little extreme for my tastes. I think that pretty much all that stuff is more important than art. (That’s probably why nobody will be reading my comics in 200 years…) And what about weddings? He goes on to say, “For every Pleasure Money Is Useless.” Tell that to the cake baker! Maybe it’s the huge bags of currency we’re throwing into the celebration fire for this wedding, maybe it’s the Christmas season, or maybe it’s the fact that I’ve been reading Dickens’ Christmas Carol in bed, but I’ve been thinking about money. Interestingly, neither [Bill] Gates nor [Warren] Buffett seems motivated by the possibility of being rewarded in heaven for his good deeds on earth. Gates told a Time interviewer, “There’s a lot more I could be doing on a Sunday morning?? than going to church. Put them together with Andrew Carnegie, famous for his freethinking, and three of the four greatest American philanthropists have been atheists or agnostics. (The exception is John D. Rockefeller.) In a country in which 96 percent of the population say they believe in a supreme being, that’s a striking fact.